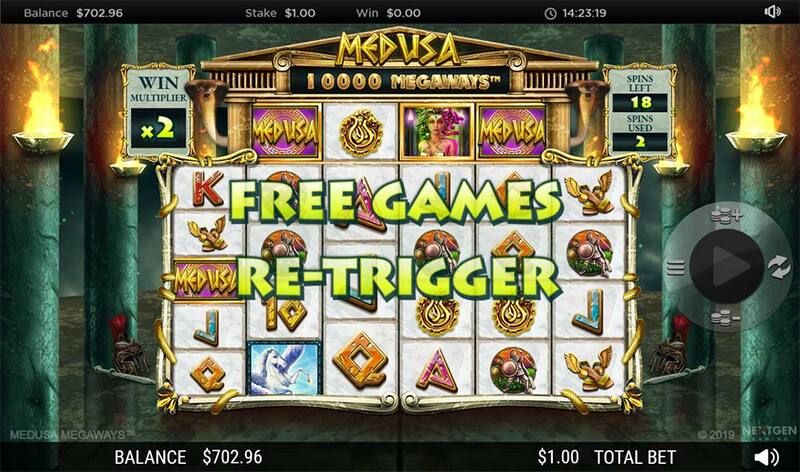 Were We Seduced After Gazing Upon the New Medusa Megaways Slot From Nextgen Gaming? Nextgen Gaming will shortly be releasing (24th April 2019) the next instalment in their very popular Medusa slot series this time featuring Megaways. Both Medusa (2009) and Medusa II (2015) have proven to be some of Nextgen’s most popular slots, not purely down to the iconic theme used but both were very high variance machines packed with a variety of base game and bonus features that still remain popular with experienced slot players including me! 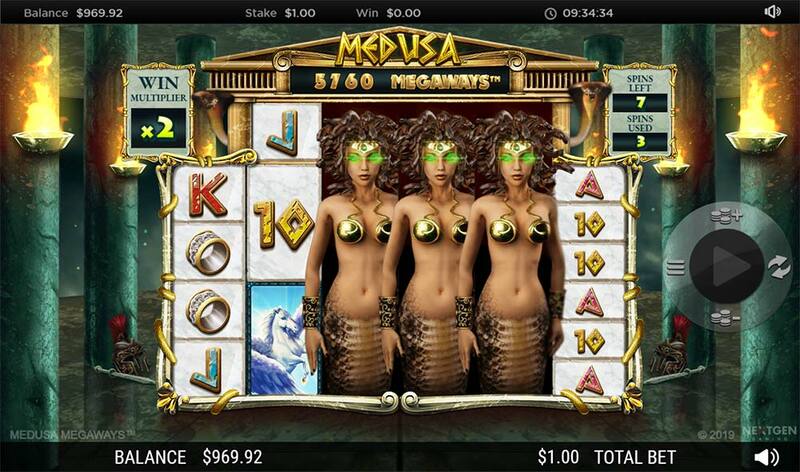 Videoslots Casino already has both of these classic slots playable at their casino and are still to this day worth checking out and will give you a good taste of what to expect in Medusa Megaways. 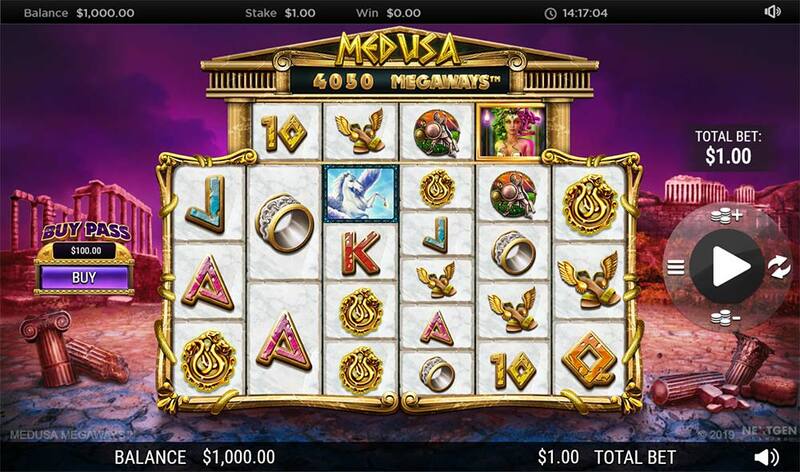 The Medusa Megaways slot is heavily inspired from the original Medusa slot with familiar symbols being replicated in this release along with special features such as Medusa’s Gaze (Added Wilds) and the Snake Strike feature (Wilds or Scatters) being added to the reels. At the core, of course, you have the classic Megasways slot format with tumbling reels after wins and rising multipliers in the bonus rounds and along with this Nextgen has introduced a Buy Pass (buy a bonus round) option that also gives you a gamble offer feature at the end of the bonus round to fully replay the free spins! It should also be noted that Nextgen is pitching this release not just as a high variance slot but coming with a Very High Variance tag, and the RTP (Return To player) does also differ depending on whether you play this slot normally for bonus rounds or opt for the Buy Pass feature which overall has the highest RTP. There are a couple of other nifty features particularly from the Medusa’s Gaze feature where any wilds that do not initially form a winning combination remain on the reels which can help set up a nice chain reaction of wins. Medusa’s Gaze occurs when the special Wild symbols appear on the extra reel above the regular reel set and transform 1 or more of the symbols on the reel below into wild symbols. If they will form a winning combination the wilds are removed from the reels in a regular tumbling reels fashion, but if not they will remain on the reels. Right snake transforms into a Scatter symbol. Instantly buy a bonus round trigger for the cost of 100x your current stake size, a £1 bet will cost £100 for the Buy Pass option. 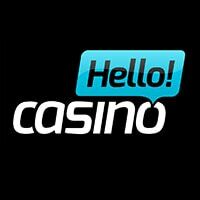 At the end of the free spins round, you are given the choice of forfeiting your total current win amount for the option of fully replaying the free spins bonus round. 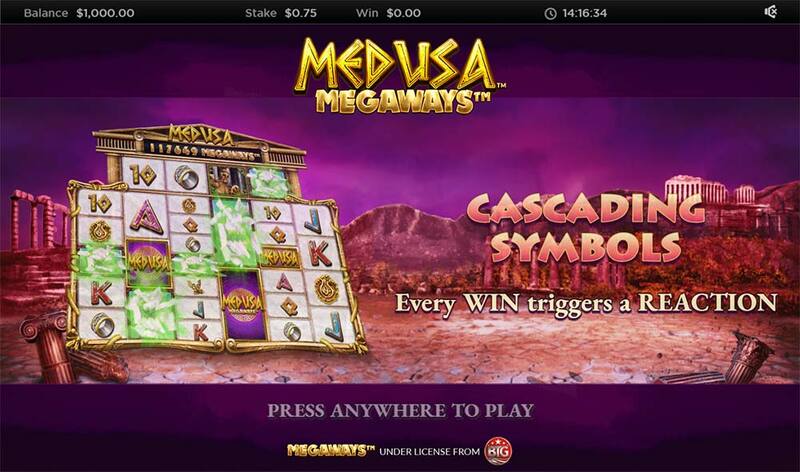 Medusa Megaways is certainly one of the more interesting Megaways releases we have played recently mainly down to the very high variance and the Buy Pass feature along with the Temptation (Replay) feature. 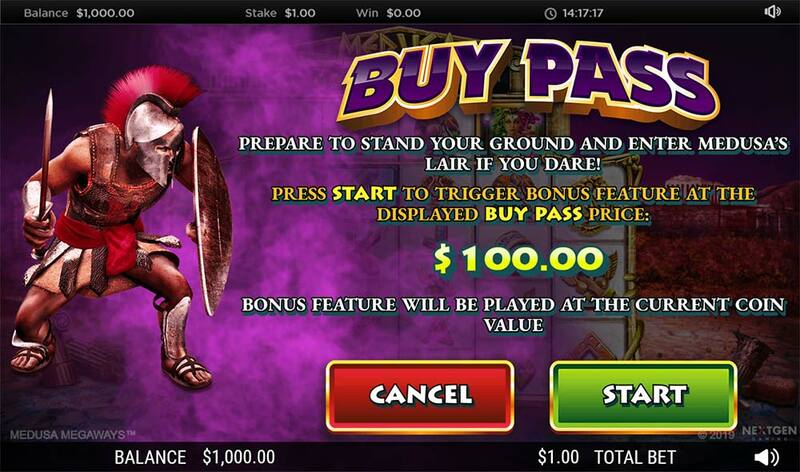 Make no mistakes this slot can be brutal, having the buy a feature option allowed us to bypass the potential long waits for the regular bonus triggers so we got to playtest the main bonus features far more extensively than usual and the results are as you would expect were all over the place from less than 1x stake to well over 500x stake wins. 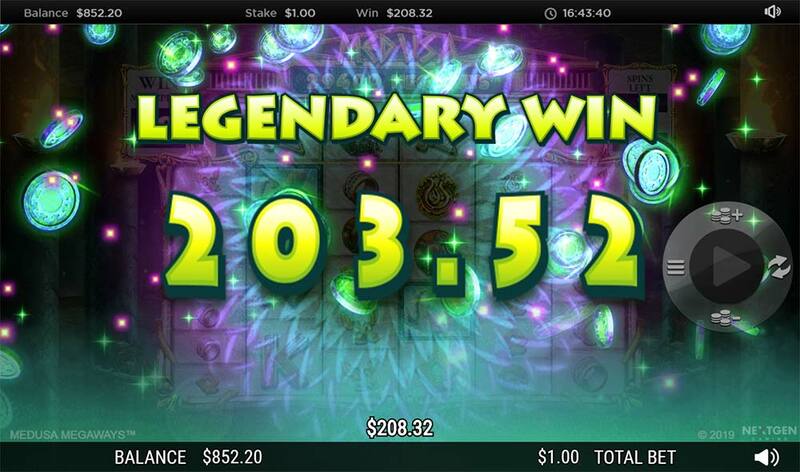 The small bonus features (added wilds, scatters) work really together and the chance of full bonus re-triggers appeared a little higher than we anticipated and is really key for reaching some of the insanely high multipliers that lead to the Legendary wins from this slot. With a claimed maximum win of over 10000x stake, we haven’t even scratched the surface of the potential from this slot! Overall I think this particular release of Medusa will get a mixed reaction, for fans of Megaways and high variance slots this should definitely appeal but for those who have fond memories of the Medusa slot series are probably looking for a more standard reel set and features that are truer to the original style.